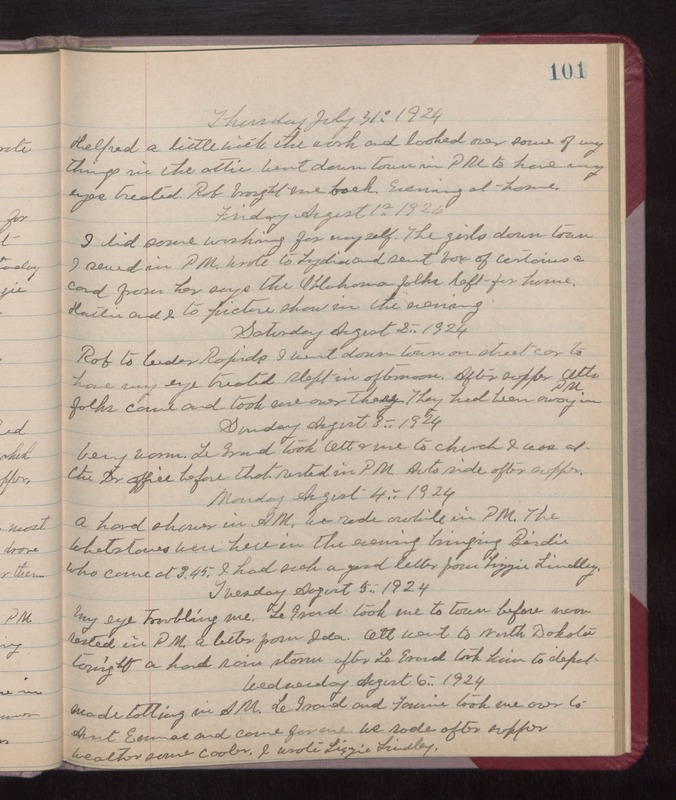 Thursday July 31st 1924 Helped a little with the work and looked over some of my things in the attic. Went down town in PM to have my eyes treated. Rob brought me back. Evening at home. Friday August 1st 1924 I did some washing for myself. The girls down town. I sewed in PM. Wrote to Lydia and sent box of curtains. A card from her says the Oklahoma folks left for home. Hattie and I to picture show in the evening. Saturday August 2nd 1924 Rob to Cedar Rapids. I went down town on street car to have my eye treated. Slept in afternoon. After supper Otts folks came and took me over there. They had been away in PM. Sunday August 3rd 1924 very warm. LeGrand took Ott & me to church. I was at the Dr office before that. rested in PM. Auto ride after supper. Monday August 4th 1924 A hard shower in AM. We rode awhile in PM. The Whetstones were here in the evening bringing Birdie who came at 3.45. I had such a good letter from Lizzie Lindley. Tuesday August 5th 1924 My eye troubling me. LeGrand took me to town before noon rested in PM. A letter from Ida. Ott went to North Dakota tonight. a hard rain storm after LeGrand took him to depot. Wednesday August 6th 1924 Made tatting in AM. LeGrand and Fannie took me over to Aunt Emmas and came for me. We rode after supper. weather some cooler. I wrote Lizzie Lindley.